Your dental care wouldn’t be the same without the use of x-rays. Finding and treating tooth decay and other diseases early is a key part of maintaining good dental health, and it wouldn’t be possible without the help of these electromagnetic waves with the ability to pass through solid matter. This is where recent advances in x-ray technology can supplement the use of conventional equipment to produce a more comprehensive portrait of a patient’s mouth. Cone Beam Computed Tomography (CBCT) can do just that: it gives dentists a highly detailed, three-dimensional view of the entire facial skeleton and teeth. CBCT machines project a cone-shaped beam of x-rays through a device that rotates around the head. As it rotates it takes multiple digital images, anywhere from 150 to 600 individual views, during a scan of 5 to 40 seconds. Afterward, the computer assembles the images into one three-dimensional view that can be rotated on screen for viewing the structure from multiple angles. 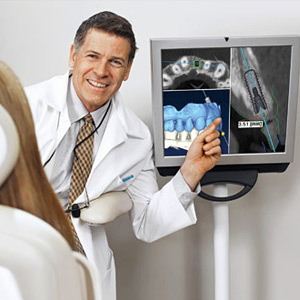 CBCT plays an important role in a number of dental specialties. For example, a CBCT scan can help orthodontists more accurately pinpoint teeth to be moved and reveal any underlying anatomical complications. It can help surgeons pinpoint exact locations for a dental implant that avoids nerves, the sinus cavities and other important structures. And scanning the airways, nose and mouth can be of great value when treating sleep apnea caused by structural problems in the mouth and throat. CBCT scans aren’t a replacement for standard x-rays, but rather an enhancement to this tried and true method for diagnosis. Still, CBCT is a safe and growing technology that promises to revolutionize dental care the same way conventional x-rays did nearly a century ago.